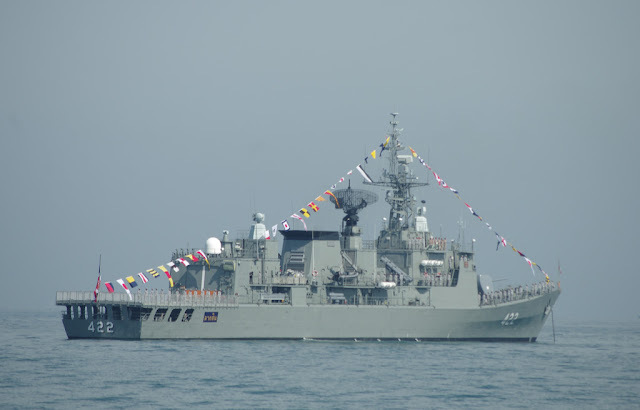 MANILA -- Two Royal Thai Navy (RTN) frigates, the HTMS Naresuan (FFG-421) and HTMS Bangpakong (FFG-456), docked at Pier 15, Manila South Harbor for a goodwill visit that will last from Friday until Tuesday. In a statement, Philippine Navy (PN) spokesperson, Capt. Jonathan Zata, said the Thai delegation is headed by the deputy commander of the Royal Thai Naval Academy, Rear Admiral Chanint Phadungkiat. Also part of the contingent is the RTN Cadet Cruise Training Unit consisting of more than 500 naval cadets. Zata said the BRP Ramon Alcaraz (PS-16) met with the Thai ships off Corregidor Island and subsequently escorted them to the berthing area. The Thai delegation was welcomed by PN delegates, headed by Naval Combat Engineering Brigade head, Commodore Alberto B. Carlos. “The arrival of our Royal Thai Navy counterparts underscores the continuing efforts to further strengthen the relationship between our governments and navies. This will further enhance and sustain the promotion of peace, stability, and maritime cooperation through naval diplomacy,” he added. In response, Phadungkiat conveyed his appreciation for the warm welcome of the PN and expressed keenness in the scheduled engagements between the two navies during their stay in Manila. The visit of the Thai delegation marks the fourth time that RTN ships arrived in the country since 2010.